Astronomers have used "earthshine" to get a spectrum of our planet that will be useful in their future searches for Earth-like planets around other stars. Nick Woolf of the University of Arizona Steward Observatory and his colleagues are reporting the work today at the 199th national meeting of the American Astronomical Society in Washington, D.C. Wes Traub and Ken Jucks of the Harvard-Smithsonian Center for Astrophysics and Paul Smith of Steward Observatory collaborated in the research. "The phenomenon of 'the old moon in the young moon's arms' is well known, " Woolf said. "For a few days before or after the new moon, we see a thin illuminated crescent of the moon, and a faint illumination of the entire remaining disk of the moon. The fainter part of this illumination comes from the Earth, with a substantial part of the day-lit Earth illuminating dawn or dusk of the moon. "As a result, it is possible to use the moon to integrate light from the Earth and to determine what the spectrum of the Earth would be like if it were seen from far away as a planet. We need this information to prepare to observe Earth-like planets around other stars." If astronomers didn't have earthshine, they'd need a special spacecraft to get the spectrum of our living planet, Woolf said. And while spacecraft are good at getting detailed views of Earth from space, they don't get a distant overview, they "can't see the forest for the trees," he said. "Even the spectrum of Earth by the Galileo spacecraft, made by Carl Sagan and colleagues in 1993, was just a small region of ocean. " Philip Goode at Big Bear Solar Observatory at Big Bear Lake, Calif., has measured the total amount of earthshine as an indicator of global change. Eric Ford, Sara Seeger and Ed Turner at Princeton analyzed theoretically how Earth's radiation could expectably vary as the Earth revolved. And Wes Traub and Ken Jucks at the Center for Astrophysics modeled the theoretical Earth spectrum. 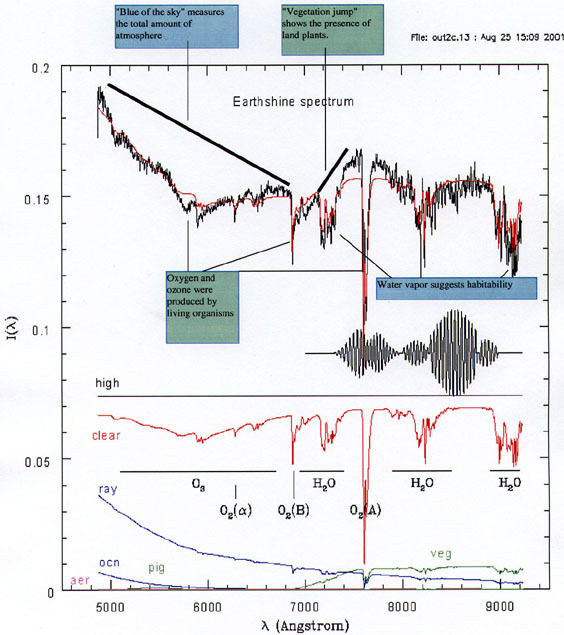 Woolf and Smith corrected the spectrum for lunar reflection, solar radiation and an extra pass of light through Earth's atmosphere by dividing the earthshine spectrum by the spectrum of the sunlit moon they also observed using Steward's 90-inch Kitt Peak telescope. They collaborated with Traub and Jucks in analyzing the data. The result showed how Earth's reflectivity varies with wavelength. "A number of features were apparent from the observations," Woolf said. "Although there was very little cloud cover at the time of observation, the clouds contributed quite substantially to the observed radiation because clouds are so bright, and sea is so dark," Woolf said. "We also saw the absorption features produced by Earth's atmosphere as they would have been seen from space. We saw many features produced by water vapor, three features produced by molecular hydrogen, and a feature produced by ozone in the upper atmosphere. " "There were also broad features. We saw the blue of the sky, caused by the molecules of air scattering sunlight. This measures the amount of atmosphere on Earth. Also, there is an abrupt rise in the spectrum in the far red, where vegetation is strongly reflective. This was quite surprising to us because only 17 percent of the illuminated area of Earth was of land. Sea vegetation is not able to produce this signature because seawater strongly absorbs light of this color. "An extraterrestrial observing Earth would have noticed that about 400 - 500 million years ago, vegetation took root on land. And since land vegetation requires different parts -- roots and leaves, for example -- it would indicate that life had taken hold strongly on our planet. Spectral features of oxygen and ozone would indicate photosynthesis by living organisms, further confirming the evidence. Any advanced intelligence that cared to inquire would know that life has been present on Earth for a very long time," Woolf said. "The visible region of the spectrum for an extrasolar planet would be very interesting to observe, and would provide different information than would be obtained by measuring the heat-glow (infrared) spectrum of Earth." The big difficulty of observing Earth is that it is so much fainter than the sun and would appear so close to it in the sky. Astronomers plan to overcome this difficulty in two possible ways. One is to have a space mission search for Earth-like planets. The other is to search using a supergiant telescope on the ground, a telescope about as large as a giant radio telescope and equipped with a highly developed adaptive optics system. Adaptive optics will sharpen images and separate the faint glow of a planet from the brilliant light of its relatively close-by star. The work Woolf is reporting today is supported as part of the Terrestrial Planet Finder project and by the NASA Institute for Advanced Projects.